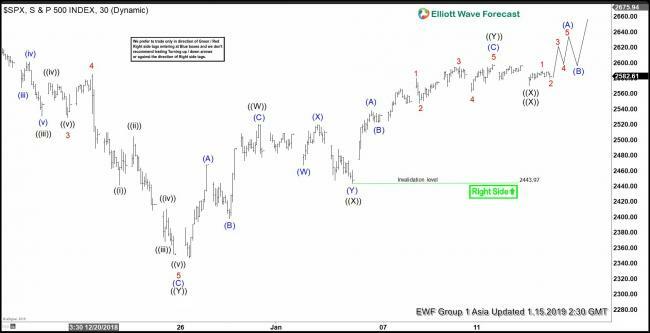 The cycle from the peak has been unfolding as Elliott Wave Double Three Pattern. 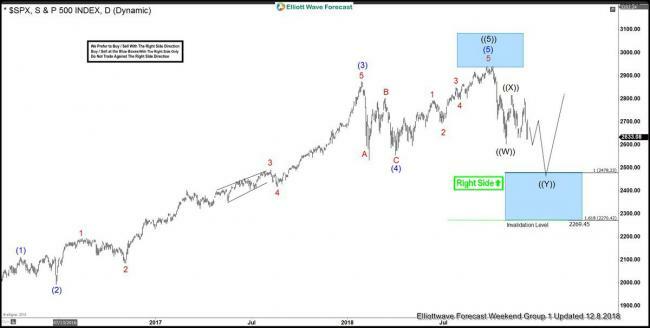 Were now in third leg down from the Septembers peak that has scope to reach Blue Box area at 2478.23. As far as pivot at ((X)) high holds, proposed extension down should follow. 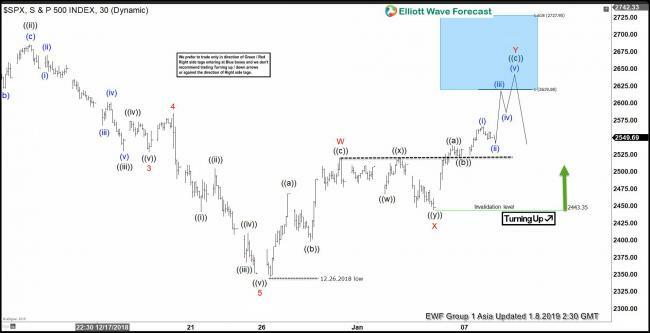 Once the indexe reaches 2478.23-2270.4 Blue Box area, sellers will be taking profits and buyers should appear for larger 3 wave bounce at least. Eventually SPX has reached Blue Box area at 2478.23-2270.4 and found buyers there. Cycle from the Septembers peak ended at 12.26.2018 low and were getting rally as expected. Now structure from that low looks incomplete to the upside. The price is showing higher high , suggesting further strength toward blue box area 2619.58-2727.95 as far as pivot at 2443.35 low holds. 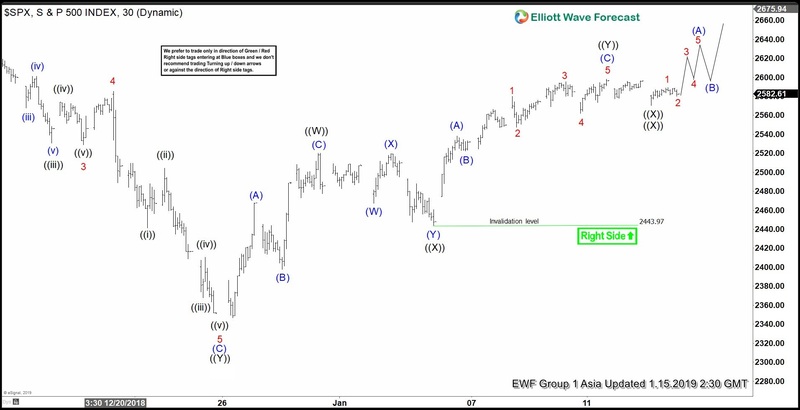 At this stage SPX is reacing blue box from the previous charts, however cycle from the Decembers low can still remain in progress as Triple Three. We expect more short term strength due to incomplete incomplete bullish sequences in DAX, IBEX and JPY pairs. Note : Some labelings have been removed from the chart in order to protect. At this stage we see possibility that SPX has ended the cycle from the Decembers low and SPX is not recommended for buying at the moment.Keep in mind that market is dynamic and presented view could have changed in the mean time. You can check most recent charts in the membership area of the site. Best instruments to trade are those having incomplete bullish or bearish swings sequences. We put them in Sequence Report and best among them are shown in the Live Trading Room. We cover 78 instruments in total, but not every chart is trading recommendation. We present Official Trading Recommendations in Live Trading Room. If not a member yet, Sign Up for Free 14 days Trial nowand get access to new trading opportunities. Through time we have developed a very respectable trading strategy which defines Entry, Stop Loss and Take Profit levels with high accuracy.